According to Jessica Goldman Srebnick, David Choe is an extraordinary talent beyond the noise, a thoughtful, deeply talented and complex person. His work is an explosion of color and form. David Choe is good. His art is explosive. He has a huge mural at Wynwood Walls and has just been selected to paint a pivotal wall mural in New York City at Houston and Bowery which is also owned and curated by Goldman Global Arts. He is also a gambler, and a very lucky one at that. The son of Korean immigrants, he grew up in Koreatown in Los Angeles and began painting, copying images from Star Wars and G.I. Joe and was soon painting street art of cartoony whales and figures. During the 1992 Los Angeles riots his parents store was burned to the ground and pushed a rebellious David over the edge. He dropped out of school, began stealing and traveling, the former funding the latter. After a short prison stint he returned home, and spent 2 years at art school. Illustrating images for magazines, he also created his own comic books, showed at any venue that would have him like ice cream shops. During a visit to Tokyo he punched a guard and was sentenced to 3 months in jail, In prison he drew using any materials available including blood and soy sauce. 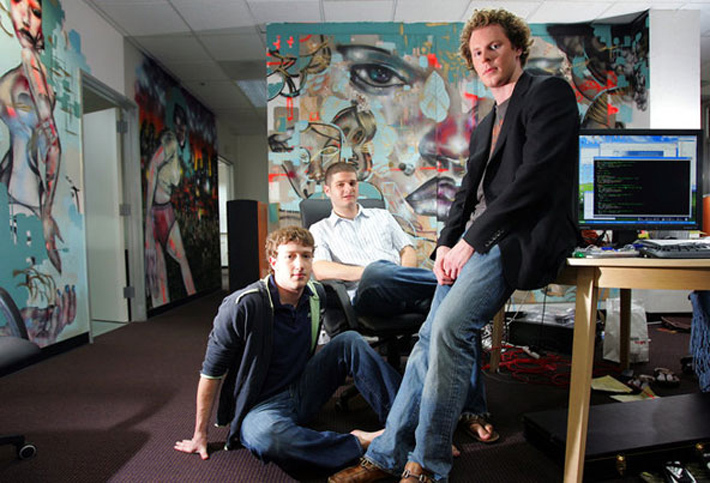 Murals by David Choe in the headquarters of Facebook. | Photo courtesy of David Choe. Flash forward to 2012 when Facebook went public and overnight Choe and his stock was worth upwards of $200 million – and perhaps a bit more he told Barbara Walters in an interview. Since then Choe has designed multi-platinum album covers (Jay-Z & Linkin Park: Collision Course), directed well-regarded music videos for Dan The Automator (Gorillaz, Deltron 3030) and other musical artists. He worked with startup Vice online and had a documentary made of him called Dirty Hands: The Life and Crimes of David Choe which has been shown at The Museum of Modern Art (MoMA) in New York. He has a hysterical series on YouTube of him and his cousin hitchhiking from Mexico to Alaska, buying sombreros, drugs and making fun of everything and everyone along the way. So while he has conquered every media from comics and books, to apparel and music, to films and television, his first love is painting. 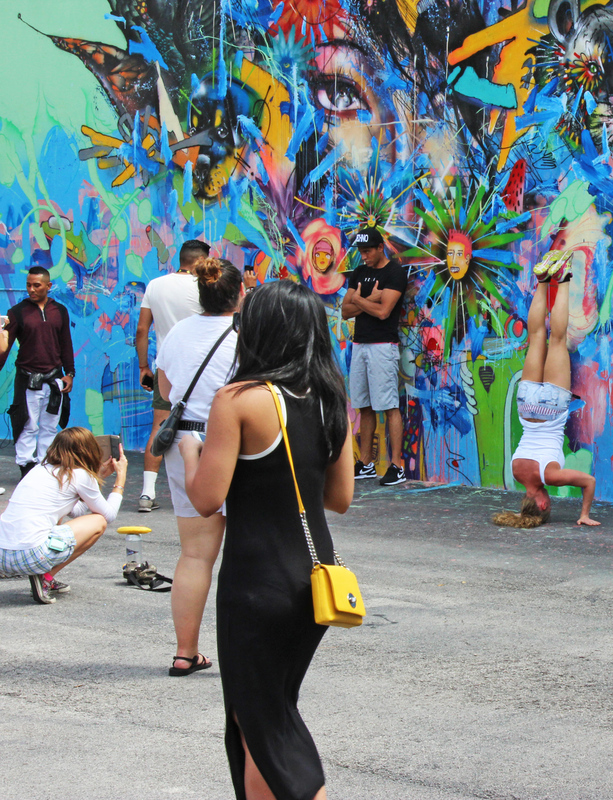 The Goldman Family hired Choe to create a 70 -foot mural inside Wynwood Walls, an explosive burst of hooded animals and fireworks emerge from a womans head, with layers of color and jagged edges against a vibrant blue and green background. Characters loom on the periphery, are they important to the woman or fragments of daydreaming? Choe began work on site at Houston Bowery the first week of June 2017 and finished the wall within 4 days. The mural will remain on view through early October 2017. Days after completing the mural it was repeatedly vandalized, whether this is a reaction to Choe’s outspoken edgy reputation or just jealous street artists is unknown. The Bowery Houston mural is important as it started in 1982, when Keith Haring painted a mural on an abandoned wall at the cross section of the two streets. The pop happy mural, featuring bright Day-Glo paint and his iconic dog and baby art characters, was an art gift to the community. The wall lay dormant until 2008 when on the occasion of what would have been Haring’s 50th birthday, Goldman Properties commissioned a recreation of the original mural. Goldman Properties, who has owned the wall since 2004, saw this as an opportunity to give permanence to the movement Haring started: using the wall to share world class art with the community. Since that time, the Goldman family has curated many artists for the wall including OSGEMEOS, Kenny Scharf, Shepard Fairey, Barry McGee, How and Nosm, Swoon and Maya Hayuk, Ron English, Futura, Logan Hicks and Pichi Avo. Choes mural will add to this distinguished list, as a true bad boy made big of street art leaves his mark from Miami to NYC and beyond. 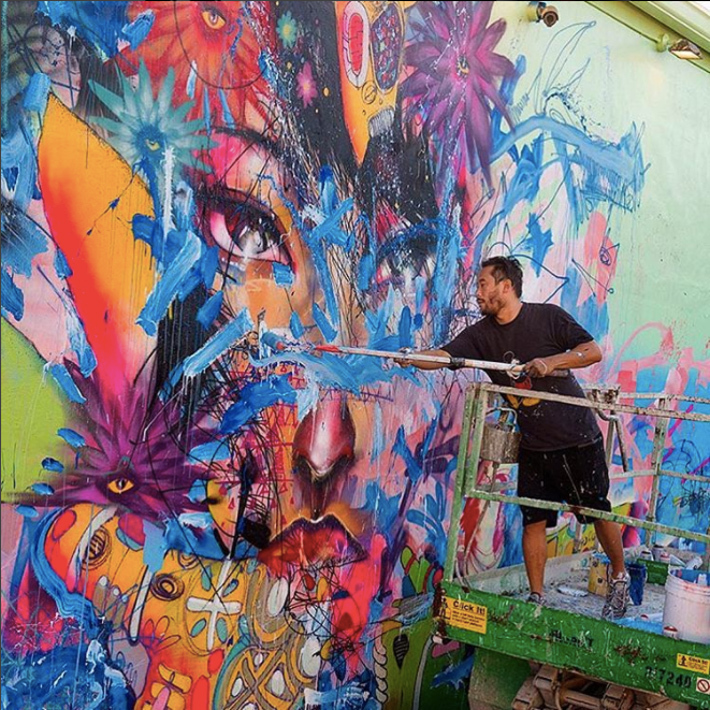 David Choe Mural for Wynwood Walls: Nothing Lasts Forever; a dead on metaphor on the impermanence of street art but also fame, success, and fortune.